This process is really sludge disinfection. Its aim is the destruction or inactivation of pathogenic organisms in the sludge. Destruction is defined as the physical disruption or disintegration of a pathogenic organism, while Inactivation is defined as the removal of a pathogen's ability to infect. In the United States procedures to reduce the number of pathogenic organisms are a requirement before sale of sludge or sludge-containing products to the public as a soil conditioner, or before recycling sludge to croplands. Since the final use or disposal of sludge may differ greatly with respect to health concerns, and since a great number of treatment options effecting various degrees of pathogen reduction are available, the system chosen for the reduction of pathogens should be tailored to the specific application. Thermal conditioning of sludge in a closed, pressurized system destroys pathogenic organisms and permits dewatering. The product generally has a good heating value or can be used for land filling or fertilizer base. In this process, sewage sludge is ground and pumped through a heat exchanger and sent with air to a reactor where it is heated to a temperature of 350-400° F. The processed sludge and air are returned through the heat exchanger to recover heat. The conditioned slurry is then discharged to a gravity thickener where the vapors are separated and the solids are concentrated (thickened). The treatment process renders the sludge easily dewaterable without the addition of chemicals. After thickening, a variety of sludge handling and disposal options are available. For example, the thickened sludge can be applied directly to land. If liquid disposal is not applicable to a specific project, the thickened sludge can be dewatered by centrifugation, vacuum filtration, or filter pressing. The dewatered residue can then be land fill or incinerated. 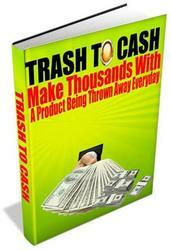 These options are discussed further on. Thermal sludge conditioning and its effects on the chemical and physical structures of wastewater sludge can be best understood from analyses of typical sewage sludges. Wastewater sludge is a complex mixture of waste solids forming a gelatinous mass that is nearly impossible to dewater without further treatment. The organic fraction of the sludge consists of lipids, proteins, and carbohydrates, all bound by physical-chemical forces in a predominantly water-gel-like structure. When the sludge is heated under pressure to temperatures above 350° F (176.5° C), the gel-like structure of sludge is destroyed, liberating the bound water. Dewatering by filtration without chemical conditioning is then a simple matter. There are several characteristics of thermally conditioned sludge which have an important effect on the cost of plants utilizing thermoconditioning. Various factors, such as thickening properties, dewatering properties, heavy metal distribution, heating value, volatile solids solubilization, and others, all have a major impact on the evaluation of various process alternatives and ultimate disposal. Thickening and dewatering properties vary depending on the type of sludge. In general, vacuum filtration rates vary from 2-15 Lbs/ft2/hr, with cake moistures ranging from 50-70 %. Lower values (2-4 Lbs/ft2/hr) are observed for high proportions of waste-activated sludge; the higher values (up to 15 Lbs/ft2/hr) are observed for sludge which are predominantly primary sludge. • Selective solubilization of materials of lower heating value in the thermal conditioning process. • Enclothermic reactions with the conditioning materials. • Operational differences in the analytical methods used for determining the heating value of the volatile content. Solubilization of a fraction of the influent-suspended solids can occur as a result of thermal conditioning. In low-pressure, wet-air oxidation, some of the organics present are oxidized as well. Solubilization of the volatile suspended solids produces a supernatant or filtrate of relatively high organic strength. Ash solubilization and volatile suspended-solids oxidation also decrease the solids loads to downstream solids-handling units. There are several advantages that thermoconditioning has over chemical conditioning. These include the sterility of the end product and a residue that can be readily thickened. Bacteria are numerous in the human digestive tract; humans excrete up to 1013 coliform and 1016 of other bacteria in their feces every day. The most important of the pathogenic bacteria are listed in Table 1, together with the diseases they cause which may be present in municipal wastewater treatment sludges. Table 2 lists potential parasites in wastewater sludge. Sludge stabilization processes are ideally intended to reduce putrescibility, decrease mass, and improve treatment characteristics such as dewaterability. Many stabilization processes also accomplish substantial reductions in pathogen concentration. Sludge digestion is one of the major methods for sludge stabilization. Well-operated digesters can substantially reduce virus and bacteria levels but are less effective against parasitic cysts. The requirement for pasteurization is that all sludge be held above a predetermined temperature for a minimum time period. Heat transfer can be accomplished by steam injection or with external or internal heat exchangers. Steam injection is preferred because heat transfer through the sludge slurry is slow and not dependable. Incomplete mixing will either increase heating time, reduce process effectiveness, or both. Overheating or extra detention times are not desirable, however, because trace metal mobilization may be increased, odor problems will be exacerbated, and unneeded energy will be expended. Batch processing is preferable to avoid reinoculations if short circuiting occurs. 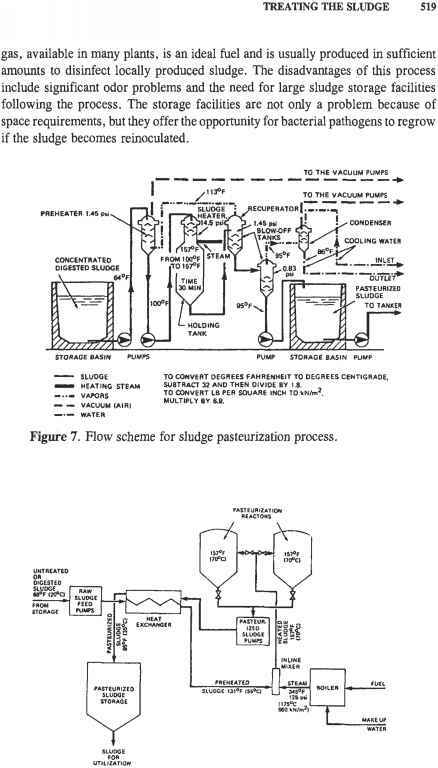 The flow scheme for a sludge pasteurization system with a one-stage heat recuperation system is shown in Figure 7. System components include a steam boiler, a preheater, a sludge heater, a high-temperature holding tank, blow-off tanks, and storage basins for the untreated and treated sludge. Figure 8. Sludge pasteurization process with heat recovery. A pasteurization process should be designed to provide uniform minimum temperature of at least 70° C for at least 30 minutes (note - some literature sources argue for higher minium temperatures). 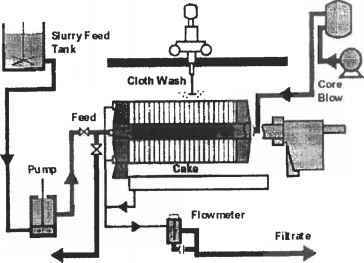 Batch processing is necessary in order to prevent short-circuiting and recontamination of the sludge, especially by bacteria. In-line mixing of steam and sludge is normally practiced to ensure uniform heat transfer among the sludge mass. This practice also eliminates the need to mix the sludge while it is held at the pasteurization temperature. Figure 8 provides us a glimpse of what important process components are in a sludge pasteurization process.